Zach Pfeffer was loaned out to Harrisburg City Islanders ahead of Saturday’s 3-1 loss in Orlando, going 64 minutes before being subbed out for former Union trialist Clesio Bauque. He is one of several Union players who have gone on short- or long-term loans to the USL PRO affiliate, including Jimmy McLaughlin, Pedro Ribeiro, Richie Marquez, Cristhian Hernandez, Antoine Hoppenot, and Leo Fernandes. In fact, at least 8 of the 15 Harrisburg players who appeared in Saturday’s game have some Union connection, including former draft pick Robbie Derschang, and former trialists Jose Barril and Bauque. 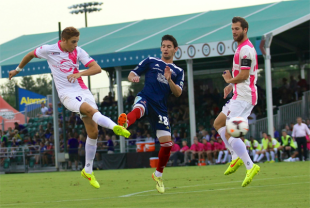 Appearing for Orlando, and recording an assist, was Reading native Corey Hertzog. The Islanders will host the Union in a friendly on August 28.